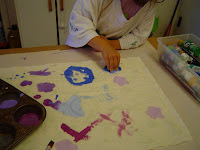 I happened upon this really awesome, really easy way to make batik fabrics with kids using glue at That Artist Woman. You really should go and look at all the ideas she has. 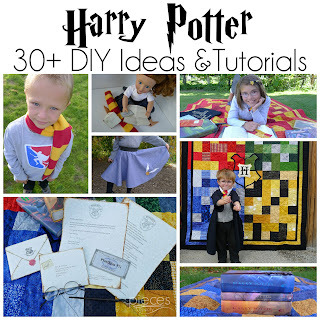 She has a ton of really super art project ideas that work with young children. Anyway, I've always loved batiks at the store, but they're usually quite expensive...so I'm excited about the possibilities for future quilting projects too. The kids and I have been working on a variation of this puppet theater, and were debating about what fabric to use for the curtains. 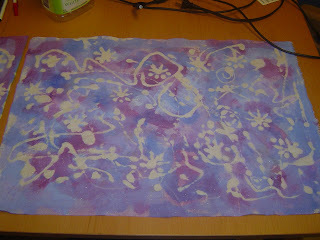 Since I'd been wanting to try the batiks project out, I thought we'd decorate our own curtains. The fabric has not been turned into a curtain yet, but I was excited to share the result...so you'll get to see the finished curtains when I post about the puppet theater. 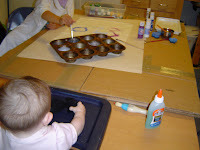 If you plan to do this, you should go and read the instructions at That Artist Woman and then these can add to hers. 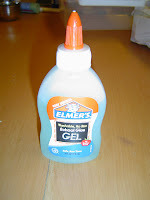 I found the blue school gel glue at Michael's for 90 cents with a 50% off Jo-Anns coupon. 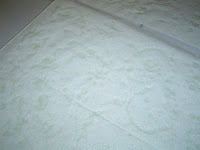 I chose to use an off white cotton fabric with little gold sparkles in it in hope the gold sparkles would show through. (They did!) They lady who developed this project says that any kind of fabric will do. 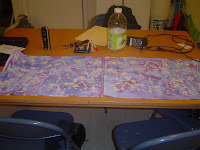 We layed the fabric out over a plastic cutting board, so glue didn't get on the table. I don't think that was necessary though. I gave Firecracker the glue after a quick demo. I let her do all the decorating she wanted to, encouraging her to spread her work out. Then when she was finished I added a bit of work of my own for more even coverage. I was hoping for a symmetrical effect between the two sides of the curtain, so I took the second curtain and put it on top of the one we'd already applied glue to (right sides together). Then I peeled them apart and layed them on our bathroom floor to dry overnight. (They seemed pretty dry after 4 or 5 hours, but I left them overnight just to be sure...plus Firecracker wanted to help me paint them and she was in bed.) I was a little worried that the glue hadn't seemed to soak all the way through...but it had, so no worries. To paint them, I used regular cheap craft acrylic paint. 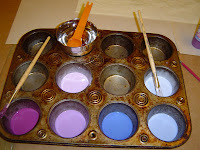 I put it in a muffin tin, so we'd have quite a few "pots" for the paint. 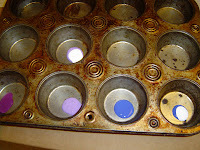 I stuck with one type of blue and two types of purple, but then added white to some so we ended up with about 7 shades, but versions of only three colors. 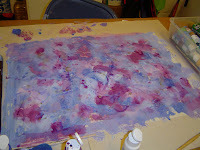 For each little mound of paint, I added about a teaspoon of water. I think next time I might water it down a bit more. I put our paper on top of some plain newsprint, on top of a box (we've got lots of those since we're getting ready to move in a few months). to protect the table. We started out painting with paint brushes, but Firecracker wanted to use some sponge shapes we'd used for a project a while ago. Those turned out to work better since we were trying to get full coverage of the whole surface...a lot faster for a four year old. I didn't worry about having her clean off the brush or sponges in between, since we were going for a mixed colors look anyway. When the whole thing was pretty covered we ended up with doing some drips/splashes for variety. (I originally tried stacking the two curtains, right sides together, to try to get the painting symmetrical as well as the glue marks, but it was pretty clear that was not going to work well. The bottom curtain wouldn't have gotten nearly as much paint as the top one, so we painted them seperately.) 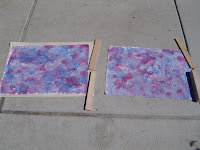 When we were done, I layed them out on top of a new piece of newsprint in the sun to dry...that only took about an hour or so, but we let them dry longer just to be sure. 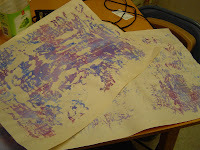 By laying them on the newsprint, we got a fortunate by-product...painted newsprint that I think we will use for wrapping paper. I didn't think of this until I'd thrown the first newsprint away, but that probably could have been used for wrapping paper as well once it dried too. 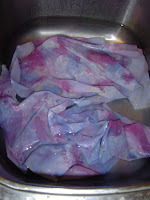 After the kids went to bed, I let the fabric soak in the kitchen sink in very warm (but not quite hot) water. The paint where the glue was just kind of flakes off, but there didn't seem to be a problem with the colors running...so it seemed like it would be safe enough to do this with clothes and not have to worry about ruining a load of laundry after the initial washing out of the glue. I considered this project a complete success and we'll be decorating the other set of curtains for our puppet theater soon! The mirror image-ness with the glue worked out great! What a great project! 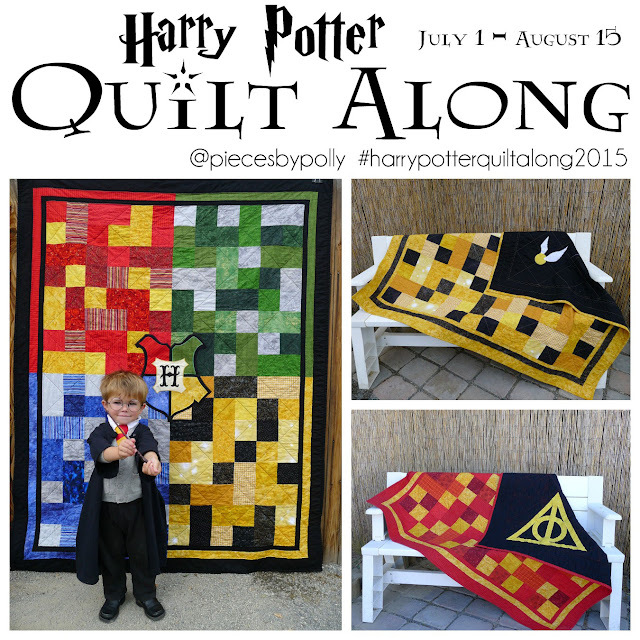 I'm envious - wish I wasn't working full time and could play with fabric, too. Good for you and the kids! That looks so much.. My Isaac would love that. I can't wait to see your puppet theater. I would love to post it on my site when you do! Well, Boy wsa definitely in favor of purple because he's always in favor or purple...but it was mostly me and Daddy and Firecracker who were doing the discussing.